Apple saw iOS 9 adoption rates slow to a trickle in November, gaining only four percent in as many weeks, though total distribution is in line with past iOS releases at 70 percent. The latest numbers come from iOS App Store checks on Nov. 30, which Apple posted to its developer webpage this week. According to the statistics, 22 percent of eligible devices are running last year's iOS 8, while users operating iOS 7 and earlier account for the remaining 8 percent share. 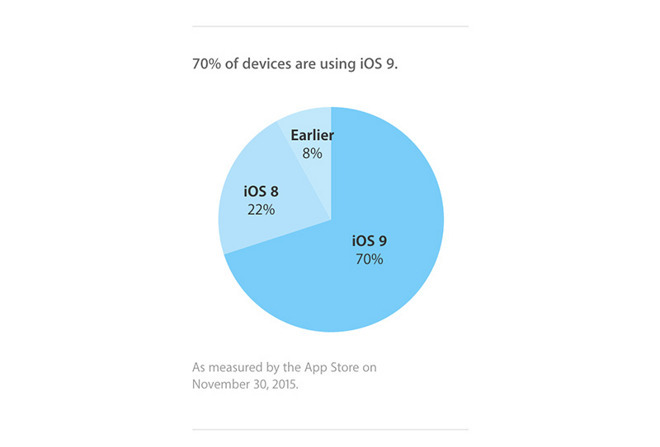 In part thanks to a later than normal iPhone launch, iOS 9 has enjoyed rapid adoption since launching in September. The operating system reached 57 percent distribution in just three weeks after registering a 7 percent jump over a two-week span in October. More recently, iOS 9.1 launched with more than 150 new emoji characters and Live Photos enhancements for iPhone 6s and 6s Plus owners, driving adoption rates up another 9 percent as recorded in early November. While iOS 9 uptake has slowed somewhat, overall distribution is on par with —or outperforming —prior iOS versions. At roughly the same time last year, for example, iOS 8 was running on only 60 percent of compatible devices, mostly due to a botched point update that brought adoption to a standstill. More in line with iOS 9, distribution of iOS 7 in 2013 hit 74 percent less than three months after launch.